Supper is a site specific performance that poses semantic questions on the experience of displacement and migration in the current social and financial climate. 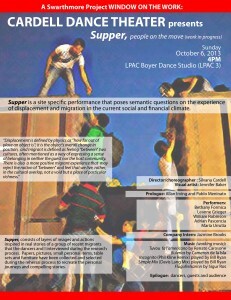 Supper consists of layers of images and actions inspired in real stories of a group of recent migrants that the dancers and I interviewed during the research process. Papers, pictures, small personal items, table sets were collected and selected throughout the rehearsal period that are part of the narrative of shared stories creating the performance. This entry was posted in Dance and tagged Swarthmore Project, Window on the Work on September 17, 2013 by twebb1. Join the dance program for a showing with Lela Aisha Jones and Flyground in the Troy Dance Lab on October 22, at 6PM. The dancers will be featuring some excerpted work from the STREET GRACE SERIES. This Flyground Series is a contemporary collection of movement performance works that cleverly blur textual and bodily memories as they are uncovered in the histories of African/Afro/Black diasporic shared experiences in the US. Currently the Series includes Native Portals of Lynching and Love, which is an abstract cultural narrative that transforms our relationship with the noose as an active agent in lynching through jolts of comedy and intensity. It puts the image of the noose front and center for everyone to work through in their bodies and systems. It starts internal and external conversations based on what has been missing or excluded as a part of our historical education in theUS—namely visibility, accountability, and healing. *Lela Aisha Jones* is a native of Tallahassee, Florida and is at home when creating. While in movement she found her entry point as an artist, she cannot be defined by one discipline or practice; her experiences have lead to a more nomadic existence. She is the founder of FlyGround—her creative home, co-founder of The Requisite Movers, and development coordinator as well as member of Mascher Space Co-op. Lela walks with her transitioned as well as living family; she is humbled and so thankful for all those who have nurtured her, especially her grandfather, mom, dad, and sister. *FlyGround* experiences are in a genre of their own but never too far from home. Since 2009, it is a movement performance company that artistically archives and rethinks the intersecting lineages of the African/Afro/Black diaspora and US black lived experiences through abstract, physical and cultural narrative. The work is a spiritual sanctuary that asks hard questions in safe spaces and honors the body and embodied experience as real landscapes that know life. We walk coherently through cultures and traditions meeting where we can and realizing where we are varied. We are grounded in native US vibes. We are home grown traces of many. We are consciously here. This entry was posted in Dance and tagged Window on the Work on September 27, 2012 by twebb1. Established in 2012, the newly formed BalletFleming has quickly emerged as an innovative and exciting new dance company. In creating original works by choreographer, writer and director Christopher Fleming, the group explores innovative approaches to storytelling, musical theatre and symphonic expositions. As a member of the New York City Ballet, Mr. Fleming danced Principal roles in works by George Balanchine, Jerome Robbins and Peter Martins. He also headed a group of soloists and principals from New York City Ballet, which toured Europe with his choreography as well as that of George Balanchine. With Mr. Balanchine’s encouragement he embarked on a career as a choreographer and received a fellowship from the National Choreographic Institute under the Direction of Barbara Weisberger. Mr. Fleming served as the Artistic Director of the Compañia Colombiana de Ballet at the Teatro Colon in Bogota, Colombia from 1985 to 1990. He was named Artistic Director of Bay Ballet Theatre in Tampa, Florida in 1993. For ten years he served as Assistant Director and Resident Choreographer for The Rock School for Dance Education, in Philadelphia, PA. This entry was posted in Dance and tagged Swarthmore Project, Window on the Work on September 7, 2012 by twebb1. This entry was posted in Dance and tagged Window on the Work, Zane Booker on October 7, 2011 by twebb1. Zane Booker will feature some of his new choreography as part of the Swarthmore Project’s Window on the Work series. Zane and company will be showing their moves on September 30th at 6:30PM in the Troy Dance Lab. This entry was posted in Dance and tagged Window on the Work, Zane Booker on September 16, 2011 by twebb1.